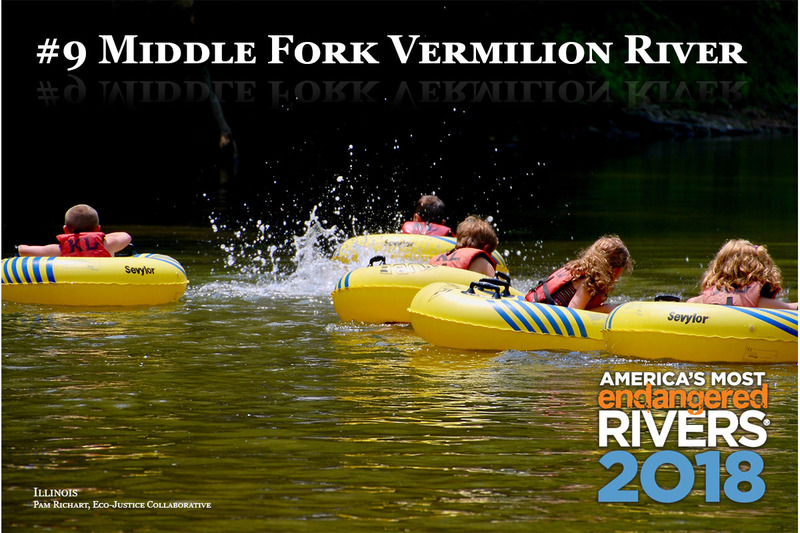 Today, American Rivers named the Middle Fork of the Vermilion River among America’s Most Endangered Rivers® of 2018, citing the threat toxic coal ash poses to Illinois’ only Wild and Scenic River. This designation, along with that of eight other rivers, showcases the battery of threats from the Trump administration, and calls on allies in Congress to clean water and rivers nationwide. More than 3 million cubic yards of waste from the Vermilion Power Station are sitting in three unlined pits along the bank of the river. The plant’s owner, Dynegy, is seeking approval to cap and abandon the pits forever. The beautiful and ecologically vibrant Middle Fork of the Vermilion flows through the heart of Kickapoo State Park, which attracts over 1 million visitors each year. Flanked by nearly 10,000 acres of public land, the Middle Fork of the Vermilion is home to the blue breast darter and silvery salamander, as well as 22 other threatened or endangered species. An archeological site along the river’s east bank is listed on the National Register of Historic Places and includes 1,000-year-old burial mounds. In warm-weather months, thousands of visitors paddle a 13-mile river trail that passes directly by the coal ash pits, which are leaching arsenic, barium, boron, chromium, iron, lead, manganese, molybdenum, nickel and sulfate into the river. These contaminants are known to cause birth defects, cancer and neurological damage in humans, and can harm and kill wildlife, especially fish. In June of 2012, the Illinois EPA issued Dynegy a Notice of Violation of Class I Groundwater Standards. Six years later, the issue remains unresolved, and the IEPA is considering a cap and leave option. Dynegy hopes to have a final decision on its proposal to cap and abandon the pits this fall. American Rivers and partners are calling on the Illinois EPA to require Dynegy to stop polluting the river and ensure that their ash pits do not pose a continuing threat to this Wild and Scenic River. Dynegy must either remove the coal ash or demonstrate they can provide another solution that prevents the coal ash from polluting the river and does not leave taxpayers on the hook for ongoing monitoring, maintenance or cleanup in the event of a catastrophic coal ash spill. This year marks the 50th anniversary of the Wild and Scenic Rivers Act. Now is the time for everyone who cares about clean water to demand that Dynegy stop polluting this Wild and Scenic River. Dynegy must act to ensure its coal ash pits do not pose a perpetual threat to the health of the Middle Fork or create a financial burden on taxpayers. Send a letter to Governor Rauner and the Illinois Environmental Protection Agency Director today. Take a moment to personalize your letter - it makes a difference. American Rivers protects wild rivers, restores damaged rivers, and conserves clean water for people and nature. Since 1973, American Rivers has protected and restored more than 150,000 miles of rivers through advocacy efforts, on-the-ground projects, and an annual America’s Most Endangered Rivers® campaign. Headquartered in Washington, D.C., American Rivers has offices across the country and more than 275,000 members, supporters, and volunteers. Rivers connect us to each other, nature, and future generations. Other rivers in the region listed as most endangered in past years include the Buffalo River (2017), Middle Mississippi River (2014), and Ozark National Scenic Riverways (2011).